There are several ways to interpret the Obama Administration’s August 31, 2013 decision to ask the US Congress to vote on a so-called «limited strike» against Syria. These interpretations need to be analyzed to see what the intentions of the US were when it threatened to engage Syria in a direct war. The first interpretation is that President Obama did not want to be solely responsible for an illegal and unilateral US attack on the Syrians. His aim was to get the backing of the US Congress to claim to have a democratic mandate from the elected representatives of the American people and to make sure that any backlash and legal blame would not target him alone. By making sure that the US Congress was his presidential administration’s accomplice, Obama could share the blame with the US House of Representatives and the US Senate. In other words, Obama wanted to ensure that he would have some type of protection before embarking on a blatant violation of international law by hiding behind US legislature and formulating some type of argument through it. With an approval from the US Congress, the Obama Administration could claim it followed the wishes of the representatives of the American people and that it is not accountable for any war crimes. The US Congress would also support this position and oppose any calls by different world powers and the international community to hold US officials legally accountable. Obama’s «redline» against the use of chemical weapons figures prominently in a debate on the nature of the US threats. Some believe that President Obama was merely embarrassed and trying to save face by enforcing the Syria redline that he made. This view, however, overlooks the fact that the US government has repeatedly been trying to indict Syria with the employment of chemical weapons for almost an entire year before the chemical attack in Ghouta. Before backing down, the Obama Administration was actually not reluctant to say that the chemical weapons redline was passed, but looking for every opportunity to try and say that the redline was passed. Despite the fact that the Obama Administration falsely claimed that it did not need the authorization of the US Congress for initiating aggression and although John Kerry appeared very enthusiastic about attacking Syria, another interpretation is that President Obama and US Secretary of State Kerry wanted to back down from ordering the Pentagon to attack the Syrians. Those that believe this interpretation think that the US government was either bluffing about attacking Syria or wanted to back down from an attack by means of using a no vote in the US Congress to save face. Other views are that the US was getting involved directly, because the insurgents were losing the war. Washington’s intervention was aimed at equalizing the playing field either to prolong the fighting or to ultimately open the door for eventual regime change in Damascus. The emphases on the limited nature of the attacks by the Obama Administration could have not only been a means to sell the war to the US population and international public opinion, but also a way of trying to get Syria’s allies not to react. This point leads to the next view. Another interpretation is that Obama and Kerry were reading the signs and wanted flexibility of action and that they put out feelers to see how Syria’s main allies in Iran, Russia, and China would react to US military threats. The threats of military intervention in Syria seem to be testing the resolve of Russia, Iran, and China. Envoys and messages were dispatched to these Eurasian powers, with careful consideration of Moscow and Tehran, to see what their reactions would be. According to Posch, Tehran had been informed by Washington either directly or through indirect lines of communication about US preparation to attack Syria. During his visit to Tehran, Sultan Qaboos of Oman could have possibly carried a message of some sort from Obama to Iran about Syria. The Sultanate of Oman has been known to act as an intermediary between Tehran and Washington before. The visit of Sultan Qaboos to Tehran took place in the same window of time that Jeffry Feltman, Ban Ki-moon’s Undersecretary for Political Affairs at the United Nations, arrived in Tehran. Before his entry into the United Nations, Feltman served as a US diplomat in Israel, Anglo-American occupied Iraq, and Lebanon before he was appointed as the US assistant secretary responsible for the Middle East and North Africa. The official reason for Jeffery Feltman’s visit to Iran was holding bilateral meetings with Iranian officials about the Syrian conflict. His visit to Tehran was formally for the United Nations, but his visit was also tied to the US government. In some form or another, he was sending a message from Washington to Tehran about Syria that essentially wanted to see what Tehran would do about a limited US-led attack on the Syrians. The responses that the Obama Administration got from Iran and Syria’s other allies may have not been the ones that US officials expected. It was reported immediately after the US said it would attack Syria that Lebanon’s Hezbollah began mobilizing its forces for a general war against the US. In Iraq various militias threatened to attack American targets and to damage the economic interests of the United States. The Kremlin sent the SSV-201 intelligence ship Priazovye to the Syrian coastline to collect information on US military movements and to augment the Russian naval armada in the Eastern Mediterranean. A Russian military leader also told the Russian news agency Interfax that the characteristics of the naval force in the Eastern Mediterranean were being amended to adjust Russia’s military position to the changing situation in the region. Vladimir Putin also promised to help Syria against the United States and called John Kerry a liar publicly. China joined Russia by dispatching its Jinggangshan landing ship to the area too. Moreover, the US government would face formidable opposition at the G20 summit held in Russia, where Beijing and Moscow would be supported by Argentina, Brazil, India, Indonesia, and South Africa in their opposition to a US attack on Syria. The US government knows that an attack on Syria is a receipt for real disaster with unpredictable consequences. If Syria is attacked, at the very minimum the US government can forget about any settlement with Iran or an easing of relations with the Russian Federation. Add China’s opposition at the United Nations and Beijing’s agitation about Obama’s so-called «Pacific Pivot» to the picture. 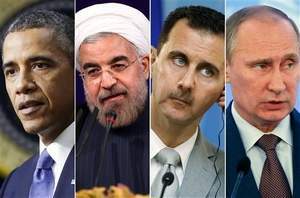 If the Obama Administration did attack Syria, it would have led to a larger confrontation and resulted in American political, economic, diplomatic, strategic, and military losses. Syria would not be a sitting duck in a direct US attack either. The Syrians could use an entire arsenal of military hardware that is impractical and inapplicable in guerilla combat. Syrian Tishreen missiles would inflect damage to any US naval units in the Eastern Mediterranean that get too close to the Syrian coast and Syria’s anti-aircraft units would prevent the US from establishing aerial dominance in Syrian skies. Damascus would fight back and there would be escalation and a regional expansion of the fighting that would draw in Lebanon, Israel, Jordan, Turkey, Iraq, and Iran right away. What Was the United States Government Planning? What was the US trying to do if it knew that it could not start a war against Syria? Regardless of whichever one of the mentioned views is correct, the outcome of President Obama’s threats against Syria has been that Iran and the US are holding direct talks and Syria has agreed to destroy its chemical weapons arsenal. What is known now is that President Obama had sent a secret letter to Tehran to open up dialogue and negotiations with his counterpart Hassan Rouhani, the new president of Iran, while he was threatening to attack Syria. Rouahani’s administration has actually begun talking about «win-win» outcomes for the US and Iran and the Iranian government also helped make the proposal with Russia that Syria destroy its chemical weapon stocks to neutralize US threats. John Kerry and Mohammed Javad Zarif, the new foreign minister of Iran, held a bilateral meeting in New York City on September 26, 2013. The next day, Obama and Rouhani had a direct telephone conversation in the first direct talk between US and Iranian leaders since 1979. Are the talks with Tehran and Syrian chemical disarmament the result of Obama’s threats to attack Syria or all along the calculated objective of Obama’s threats to attack Syria? If Russia, Iran, and China formed a formidable opposition that would have prevented US attacks on Syria and if Syria would have been able to protect itself, it sure looks this way.